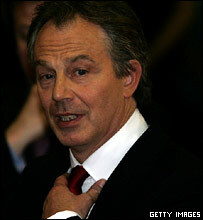 BBC NEWS | UK | UK Politics | Election 2005 | An early exit for Blair? Tony Blair: Staying or going? When Tony Blair pre-announced his resignation last autumn he ensured the days after any third election victory would be dominated by that single fact. There are many in the Labour party who believe that announcement was a huge mistake, it may have staved off trouble in the short term but it stored up even worse for the longer term. They claim he made himself a lame duck leader and, they argue, the result of the general election has only further weakened his position by suggesting voters sent a distinct message that they wanted Labour, but not Blair. So it must have come as no surprise to the prime minister or his close aides, that the calls for him to go soon have started already. And it is hard to see how they can be silenced. It is equally predictable that the likes of the prime minister's former spin chief Alastair Campbell and rehabilitated minister David Blunkett will insist that Mr Blair will do as he pledged, and serve a full third term. And it may even be that they, and the prime minister himself, truly believe that that is not only possible, but desirable for the Labour party. But it has long been hard to find anyone but the staunchest loyalists in the parliamentary Labour party who believe it will work out to the prime minister's timetable. With Gordon Brown knocking on the door of No 10, and having done so much to bail out the prime minister during the election campaign, it is widely believed Mr Blair will indeed go sooner rather than later and attempt an orderly handover to the chancellor. There has even been fresh speculation that the two men did another deal over the leadership at the start of the campaign. There are a number of factors that point to an early departure. Firstly, the prime minister may have what would normally be seen as a perfectly healthy Commons majority, but by his standards it is a dodgy one. It remains to be seen just how this will affect the voting tendencies of his rebels or the new intake of Labour MPs. But it is a fair bet to predict things will be a lot tighter, and he will find it difficult to bulldoze through controversial pieces of his legislation and may even abandon them. Plans for ID cards are regularly quoted as the most likely victim. Mr Blunkett's claim that Labour MPs stood on a manifesto which included the plans, so they should support them, is not likely to sway too many of the old rebels, and may not cut much ice with the new intake. There was a distinct feeling throughout the campaign that many candidates were distancing themselves from the prime minister and expected to serve much of their term under prime minister Gordon Brown. Secondly, whatever deals may or may not have been done, the chancellor and his allies will probably be working on the basis that they will need a considerable period of time in Downing Street before the next general election to recast the party in the chancellor's image if they are to win that fourth term. So the remaining factor is probably the prime minister's desire to secure some sort of legacy over and above the one as the man who took Britain into a deeply controversial war or the leader who Labour an unprecedented third consecutive victory. He and Mr Brown went some way towards that during their joint campaign appearances when the chancellor talked about Mr Blair's achievements and suggested Labour would forever be New because of him. But many believe the greatest successes of the past eight years have been as a result of things the chancellor did for the economy. The prime minister will want something else to go alongside his entry in the history books. So all eyes have turned to Europe as perhaps the last great opportunity for Tony Blair, by finally securing Britain's place at the heart of Europe. But even that looks extraordinarily difficult. If a big country like France votes "no" to the EU constitution there is a very good chance that there will be no referendum in Britain. The prime minister has said he can only hold such a vote if there is something to vote on. Ironically, as he will take over the rotating EU presidency in the summer he will play a central role in deciding how to progress after such a "no" vote. Alternatively, if the referendum goes ahead, he will have a huge task turning public opinion around to support the constitution. If he succeeded then he would indeed have secured that legacy. If he failed, he would be forced to resign in any case - but as a loser. It is these thoughts that may well be whispering to the prime minister that his only hope of achieving a lasting legacy will be by finally forcing through a genuinely radical third term agenda and that would mean staying on as long as possible. Whether he will have the luxury of deciding for himself will remain the greatest question in Westminster for some time to come.